Cassette air conditioners are suitable for commercial and residential properties with large open areas and limited wall space. Most of the components of cassette units are hidden in the ceiling and come in a range of sizes and capacities. Because they take a large amount of space in the ceiling, you need to consult an expert installer to find out where it should be installed. 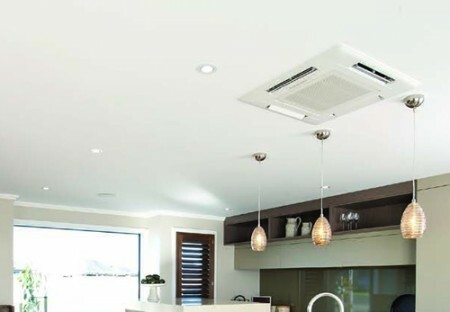 At AirMaster, our air conditioning specialists have installed many cassette air conditioners and are knowledgeable on the proper places to install them in both residential and commercial properties. Cassette air conditioners have swing louvres that are used to direct air flow. These parts ensure that air is properly circulating in a room. Most units have louvres that can be set into a desired mode. Users can position them up when heating is needed and down when cool air is desired. The louvres not only cools or warms a room, but it also ensures that every area of a room maintains your desired temperature. The only maintenance that is needed for this type of air conditioner is to ensure that its filter is clean. Cassette units have a detachable air intake grille and a filter that needs to be washed occasionally. Many cassette air conditioners have a dry mode that can be set to control a room’s humidity level. This setting can be used if a room does not need to be cooled. Reducing humidity helps maintain the comfort in a room without having cold air circulating. Since most of the unit is hidden in the ceiling, you’ll only see the thin grilles and the four vents. This makes cassette air conditioners suitable for any design plan in a modern home as well as an office or commercial building. Using advanced cooling technology, cassette air conditioners reduce power as soon as it senses the room has reached the right temperature. This feature allows you to save money on electricity bills. If you want to know more about this air conditioner’s features and benefits, give us a call on 0800 125 959. We will be glad to answer your questions and help you choose the right placement of your cassette air conditioner in your home or office.